OH my…I am so sorry! I see that somehow the POST didn’t get in here with this. My mind has just been everywhere but here. All I can say is it’s been a really bad 30 days! Anyway…this is for the Technostamper Monday Lunchtime Sketch Challenge. As usual, I did my own little twist to the sketch. I just love this little ‘sun’ and had done another ‘sun’ card for a different Technostamper Sketch challenge and thought it would be so cute with this one too! 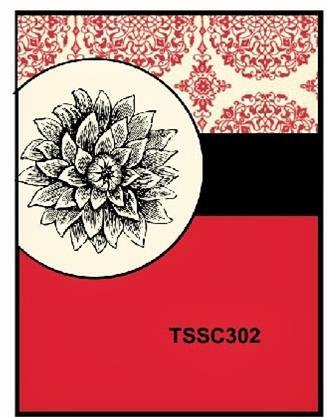 Whisper White – 3/4 x 3 1/2 and add to card front. Make sun – 1 1/2 Crushed Curry circle (framelit) and add 5 each of two different Crushed Curry Prints (from the Celebrations Add-on Kit) using the Banner Punch (SAB). Add behind circle and add to card front using dimensionals. Make sure finished size is no more than 4 1/4 in width. 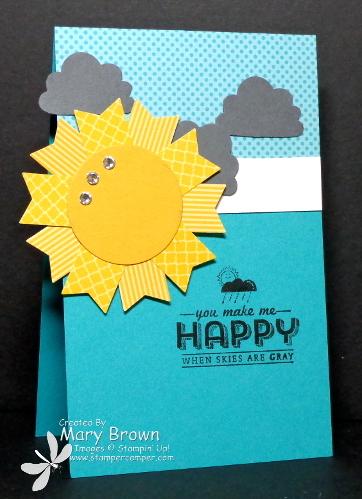 Make clouds using Basic Grey and Build a Cupcake punch and add to card front. Add a couple Basic Rhinestones to the sun to finish it off. I took the sketch and make the base narrower so that my element could hang off the side. Otherwise…exactly the same! Don’t forget to check out the other members of the team and remember go to the Technostamper blog to play along! This entry was posted in Sale-a-bration, Technostamper Challenge and tagged See Ya Later. Bookmark the permalink. This is so cute! I love these suns too. Really fun idea to make your card smaller so the sun could hang off–you always do that well. Fabulous card, thanks so much for being a part of the TSSC team!